One spring evening several weeks ago, I came home to find a little package waiting for me. Much to my surprise and delight, it contained one of my favorite things. 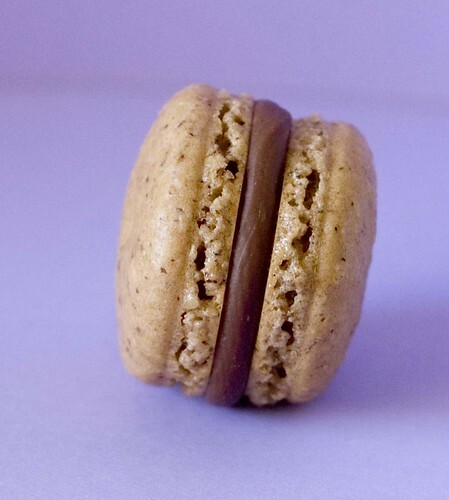 Two oh so scrumptious violet cassis macarons from Paulette! I was overjoyed and immediately knew what to do as a thank you for this unexpected treat. 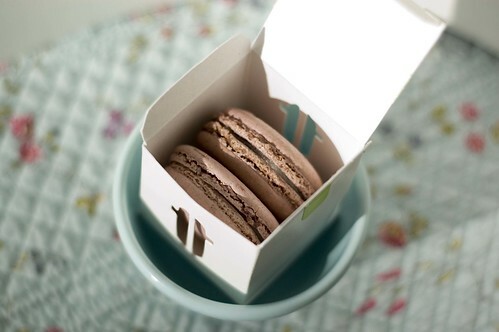 What better way to show your appreciation for being sent some macarons than with...more macarons! 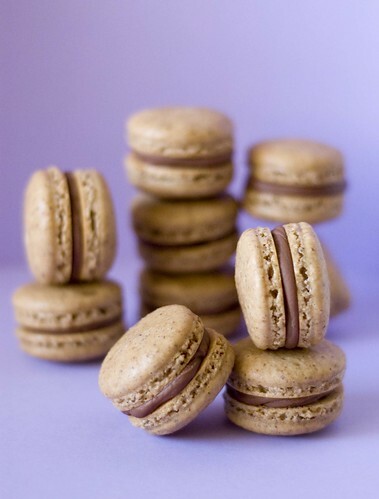 I happily whipped up a batch of espresso hazelnut macarons along with some milk chocolate ganache to fill them with. Everything turned out wonderfully and I was very pleased with the final product. I'd made this recipe before, but the espresso powder I had used previously was a little old, so the coffee flavor tasted a bit off. Not this time - the flavor combination was perfect. 1. Sift together the hazelnut flour, almond flour, powdered sugar and espresso powder. Set aside. 2. In a stand mixer, beat the egg whites. Slowly add the granulated sugar once they begin to get foamy. Continue to beat until you have a stiff glossy meringue. One test is to turn your bowl upside down and if the meringue stays put, it's stiff enough. 3. Now comes the tricky part! Gently fold in the flour mixture into the meringue. I usually do this in 3-4 additions. Mixing in each incorporation well before adding more. Some directions say to start mixing briskly, but I take it slow and gently fold the entire time. You can never be too careful with such a temperamental batter! What you're looking for is a consistency that is frequently referred to as flowing like 'magma'. Think, slow oozing mass. If it spreads out quickly, you've mixed too much. 4. Add your batter to a pastry bag fitted with a plain tip and pipe into approximately 1" to 1 1/2" circles. (I use this template - print out two and tape them together to fit a sheet pan. Place it under your silpat or parchment to pipe the shells and remove it before baking.) One tip I learned about piping the shells is to hold the tip of your pastry bag right over the middle of the center of the template and pipe one large blob into the circle rather than pipe a spiral to fit into it. If you attempt the latter, your shells will never be smooth or evenly round. If a slight peak remains once the shell has been piped, dampen your finger with a bit of water and gently tap it down. Be careful not to have too wet of a fingertip otherwise the excess water will cause unsightly tumorous growths (love that blog btw!). They'll still be tasty, just not very pretty. 5. Let the shells sit out for at least 30 minutes to develop a slight crust or skin on top. You should be able to touch the top without feeling any stickiness (I usually let mine sit for an hour). 6. Bake at 300° F for 12-14 minutes. Be sure to know if your oven runs warmer or cooler and adjust your baking temperature. I personally have to bake mine at 310° F.
7. Let shells cool completely before filling. 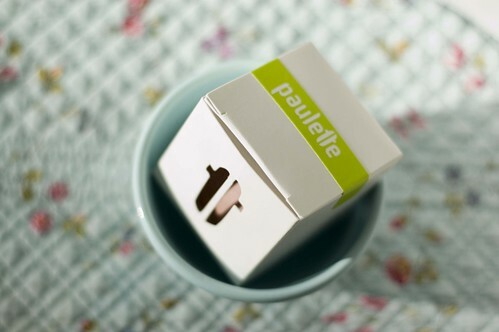 Place the chocolate in a heatproof bowl. Heat the heavy cream in a saucepan until it just starts to boil. Pour over the chopped chocolate and let sit for about 1 minute. Gently stir until all the chocolate has dissolved. Let cool to desired consistency. I haven't tried to make macarons yet, but you inspire me. They're just lovely. Me too - it's one of those things I keep saying I'm going to try, but have yet to tackle. Yours are an inspiration. perfect. 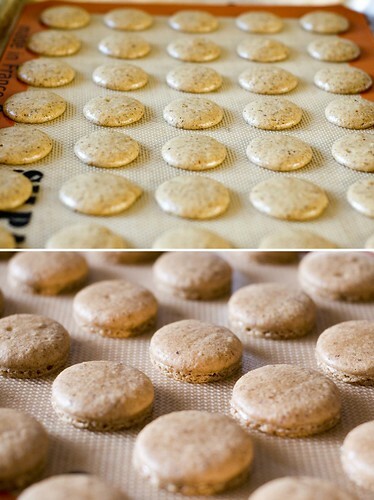 Love macarons but have never had the guts to make them...yet! Can you tell me what you mean by "aged" eggwhites? I assume you mean out of the shell, but are the whites refrigerated for the 24 hours or covered/left out? Thanks! Just found your blog and will be checking it out regularly. 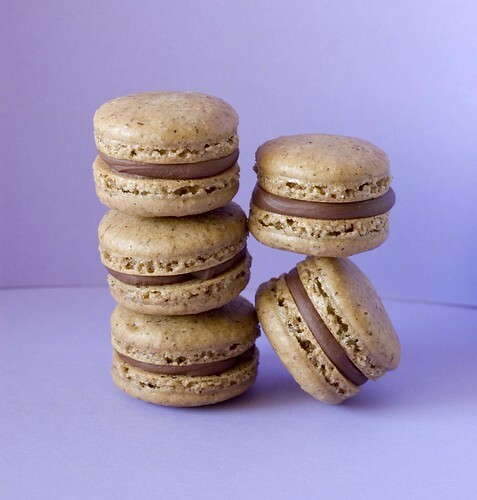 Macaroons are my failure recipe but I adore them so I'm going to give your recipe a go. Love your pics - would you be so kind as to share how you set up that lovely lilac background? @Sharon - sorry for the late reply, but yes, "aged" means left out in an open container after separating from the yolk. You can also just separate them and leave in the refrigerator (covered or not) which is what I usually do. I've done it both ways and don't see any difference.